The Buddha's teachings have a unique and sometimes challenging language all their own, constructed from the many cultures and generations of practitioners they have touched. To help readers navigate this vast lexicon, Venerable Tzu Chuang, a senior Fo Guang Shan monastic and the first abbot of Hsi Lai Temple, compiled FaXiang, an encyclopedia of Buddhist terms both extensive and accessible. 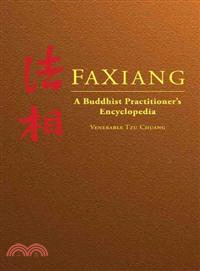 Now available in English, FaXiang is replete with detailed entries explaining Buddhist etymology and history, as well as details of practice and religious significance. With each English article indexed and annotated in both English and Chinese, FaXiang is a valuable reference for those who wish to learn more about Buddhism, as well as for English readers beginning to delve into reading Chinese Buddhist writing. Venerable Tzu Chuang has been a Buddhist nun for over fifty-five years and has spent her life working to promote Humanistic Buddhism. She is a senior Fo Guang Shan monastic and was the founding and first abbess of Hsi Lai Temple in Hacienda Heights, California.